Driving Visitor Engagement by bringing museum’s collection online in the Digital Age! Home/Blog/Driving Visitor Engagement by bringing museum’s collection online in the Digital Age! Museums provide amazing opportunities to engage the visitors with history and culture and hence it is important for the museums to become accessible to the people of all age groups so that they can experience this history and culture whether physically or digitally. With this thought in mind, our team set out to create a solution that can help museums to shift in the way they present their artifacts. There are people who really don’t find it easy to visit the museum as they have their own challenges. So why not with the help of Collection Online for Museums make your artifacts accessible to such audience who are willing to take your museum tour but because of certain reasons they fail to visit. The solution helps museums to remove the barriers that stopped the aged or disabled people from visiting the museum. At MuseumAnywhere our goal is to provide experience and participation in the museum to all visitors. 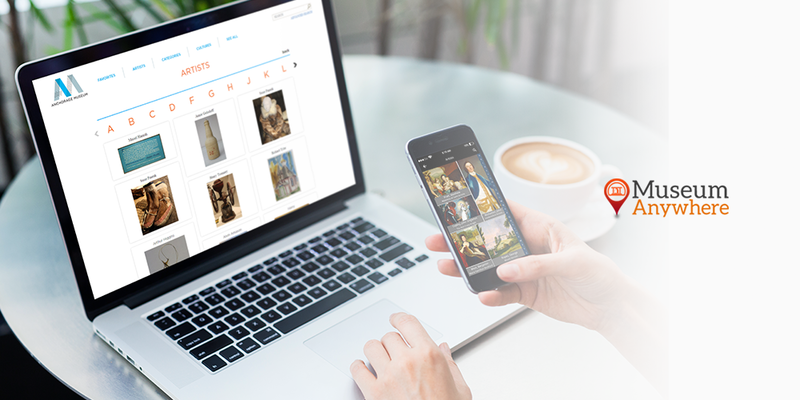 By removing barriers from displaying the artifacts on the walls of the museums we help you bring the collection online to your website or in the form of a mobile app. We had to ask several questions to ourselves that how we can make a solution for the audience who could sit at the comfort of their home and enjoy watching the artifacts just with few clicks. What design will enhance their experience? Can the students utilize the information for their research work? Will they feel valued with our solution of bringing the collection online for them? Coming up to the conclusion, our team has worked with museums in helping them make their museum collection easily accessible especially for the educators, students, and researchers. You must be wondering how it works! The Collection Online solution already integrates with your TMS collection System and can also be quickly implemented on top of any other collection Management system. It allows a large number of artifacts to be available on your website wherein the user can choose categories, themes, artists or other criteria according to their own interest. For museums, it was a bit difficult to collect the visitor data, but now you can easily get visual analytics on what the user has most viewed, most favorite and most shared on the Social Media. Museums embracing the solution and if you have been looking for such solution then bringing your collection online would be the right choice you can make. There are few more exciting features associated with Collection Online for Museums that our museum clients are leveraging. We hope this blog will help you and if you have any other queries, feel free to discuss it with our expert. Write at sales@MuseumAnywhere.com or call 703.652.6630 and we would love to answer it! Previous Previous post: What are Museums for and how can they bring innovation in member engagement? Next Next post: Are you still using Audio Tours? Turn your visitor’s walk with audio and video tour!